Parker's ProBloc Series modular valve is designed to replace conventional multiple-valve installations currently in use for interface with pressure measuring systems in process control applications. Parker’s ProBloc series modular valves are designed to replace conventional multiple-valve installations currently in use for interfacing with pressure measuring systems. 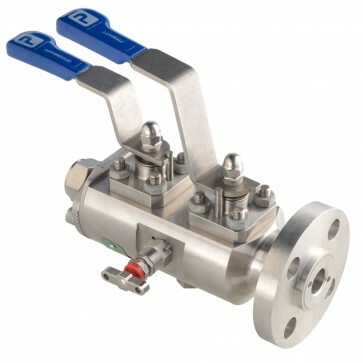 The traditional way of creating a double block and bleed valve was to use three separate single isolate ball valves, a tee piece to join them together and a flanged weldolet to connect to the process pipeline. This was modified to bolt three valves together using through bolts and was referred to as a modular valve. No supporting is needed as the modular valve is small and light compared to the original method, It is easier to operate as the three valves are much closer together. By building three valves into one body to create double block and bleed valve you reduce the amount of potential leak paths, reduce the weight which is critical in offshore facilities, reduce the size and therefore the space taken up, very important offshore but also in onshore applications. By combining customer-specified ball and needle valves into a single manifold, Parker’s ProBloc modular valves significantly reduce the number of potential leak paths. They also have a lower system mass. This reduces loading and vibration stresses, further improving safety and reliability. Parker’s ProBloc valves are available in a range of configurations, including double-block, block-and-bleed, and block-bleed-block. Standard flange sizes include 1/2", 3/4", 1”, 1-1/2”, 2” and 3”. 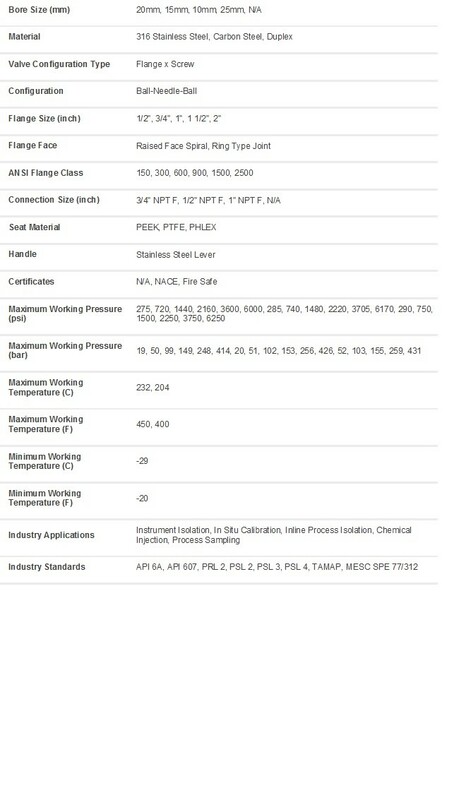 There are extensive choice of flange classes, from ANSI 150 to 2500. The pressure rating and operating temperature range depend on the type of valves specified by the customer. There is a choice of 10, 15, 20 and 25 mm ball valve bore sizes. The standard outlet has a female NPT connection and matches the size of the valve bore. A wide range of alternative metric sizes, from 6 to 25 mm, and imperial sizes, from 1/4" to 1” is available, and other connection options include male NPT, and Parker CPI© single ferrule and A-LOK™ double ferrule compression fittings.